Initial claims for unemployment insurance continue to improve, although claims are still somewhat above where they would normally be when the economy is at full employment. While there is a good deal of noise in the week to week figures, the trend has clearly been an improving one. But there are concerns that weak US growth, and problems stemming from Europe and elsewhere, could undermine the improvement seen so far. The data come from this morning’s regular weekly release by the US Department of Labor, and it is helpful to see the figures in the longer term context. The graph above updates one from my posting of November 20, 2011. Initial claims for unemployment insurance came to 348,000 in the week ending February 11, far better than the roughly 650,000 per week who were being laid off and filing claims for unemployment insurance when Obama took office. The initial unemployment claims are still somewhat above, although now fairly close to, the level of around 310,000 to 320,000 per week that one would see when the economy is at close to full employment. As was discussed in a January 19 posting on this blog on the dynamics of the labor market, there is constant churning in the jobs market, with workers being laid off even when the economy is at full employment. And as was shown in the second graph in that January 19 posting, layoffs are now close to where they were before the 2008 economic collapse. But new hires remain (at around 4 million per month) well below where they would be when the economy is operating at full employment (around 5 million per month). Hence unemployment remains high (8.3%). Firms have a surfeit of cash in their accounts from very high profits (see posting here), but there is little demand for extra production. Unfortunately, it is now politically impossible (due to concerted Republican opposition in Congress) for the government to follow the expansionary policy one would need to provide that demand. So the economy continues to grow, but slowly. Hence the employment situation has continued to improve, but only slowly. And there are concerns that the on-going recovery in 2012 remains fragile. As was noted in a January 27 post, US growth in the fourth quarter of 2011 was largely due to a large increase in inventories. This is unlikely to continue, and even if inventory growth increases again as much as it did in the fourth quarter (with all else growing as it did in the fourth quarter, although these will of course change), GDP growth would come to only 0.8% at an annual rate. There are also major concerns arising from Europe. Europe has been following deliberate austerity policies, and consequently is likely now in recession. It was announced yesterday that GDP fell in the EU as a whole at a 1.2% annualized rate in the fourth quarter (0.3% at a quarterly rate). The normal criterion for a recession is for two quarters of such negative growth. The Greek crisis is also not resolved, and could get much worse. And there are other global concerns as well, such as the risk that tensions with Iran could escalate and lead to an attempt to close of the Straits of Hormuz, and cause oil prices to skyrocket. So while the labor market has improved, there are concerns on whether this can be sustained. 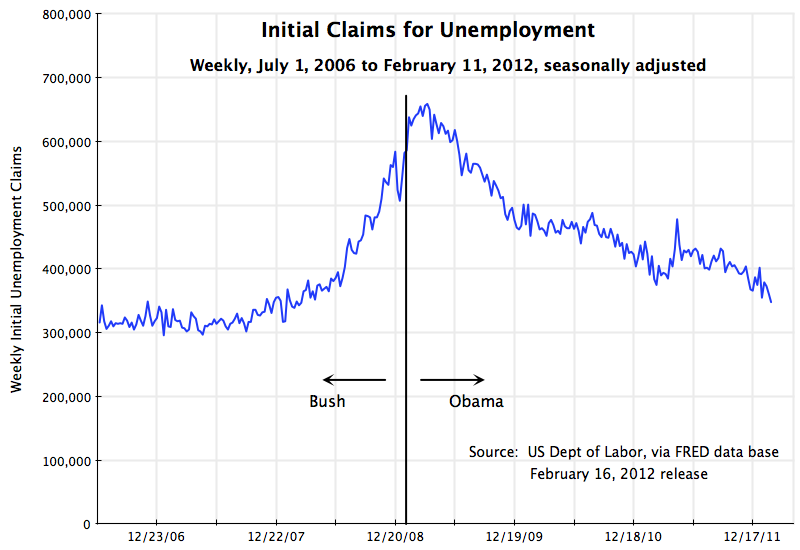 This entry was posted in Labor and tagged economic crisis, employment growth, jobs, unemployment by aneconomicsense. Bookmark the permalink.